SAR's White Papers are the published result of periodic Think Tank retreats where SAR Board members explore and systematically review specific topics/issues in acupuncture research. These are "must-reads" for anyone interested in looking at acupuncture research from a wider perspective of what's happening in the field and then delving more deeply into each area of focus. Research into acupuncture has had ripple effects beyond the field of acupuncture. This paper identifies five exemplars to illustrate that there is tangible evidence of the way insights gleaned from acupuncture research have informed biomedical research, practice, or policy. The first exemplar documents how early research into acupuncture analgesia has expanded into neuroimaging research, broadening physiologic understanding and treatment of chronic pain. The second describes how the acupuncture needle has become a tool to enhance biomedical knowledge of connective tissue. The third exemplar, which illustrates use of a modified acupuncture needle as a sham device, focuses on emergent understanding of placebo effects and, in turn, on insights into therapeutic encounters in treatments unrelated to acupuncture. The fourth exemplar documents that two medical devices now in widespread use were inspired by acupuncture: transcutaneous electrical nerve stimulators for pain control and antinausea wrist bands. The final exemplar describes how pragmatic clinical trial designs applied in acupuncture research have informed current general interest in comparative effectiveness research. 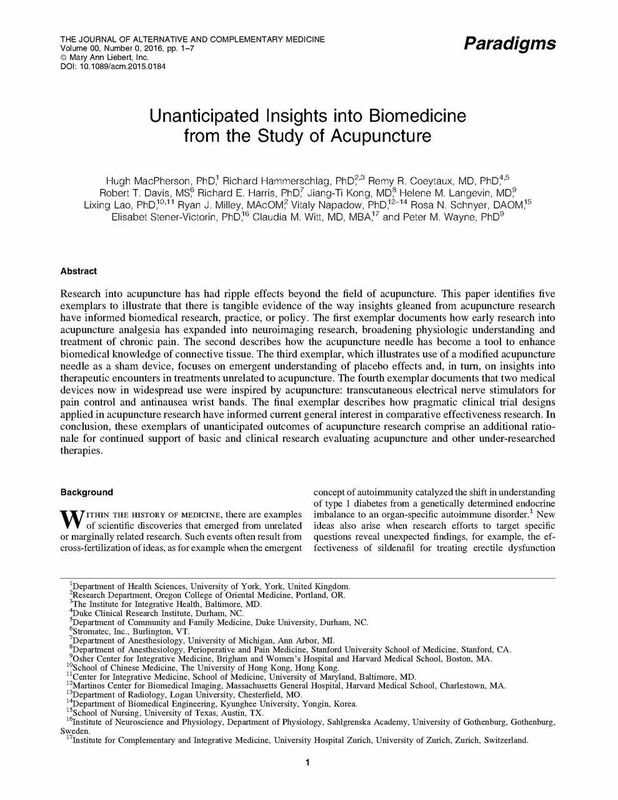 In conclusion, these exemplars of unanticipated outcomes of acupuncture research comprise an additional rationale for continued support of basic and clinical research evaluating acupuncture and other under-researched therapies. In keeping with SAR’s mission to promote, advance and disseminate scientific inquiry into Oriental medicine systems, we have published our White Paper, highlighting current issues and setting forth proposals for the next decade of acupuncture research. On September 22-23, 2008, SAR held a Board workshop at Georgetown University to culminate 3 months of preparations in developing this White Paper. The workshop was hosted and facilitated by a nationally recognized leader in CAM education and research, Aviad (Adi) Haramati, PhD, Professor and Director of Education in the Departments of Physiology & Biophysics and Medicine at Georgetown University School of Medicine. Generous donations from the professional and educational acupuncture community and matching grant from the National Acupuncture Foundation made the development of the White paper possible. We are deeply grateful for everyone’s support, and we are confident that this paper will provide a very important next step in acupuncture research.